KUALA LUMPUR, 30 October 2016 – China’s Feng Shanshan wrote her name into the record books as she became the first golfer to win a second Sime Darby LPGA Malaysia title following an impressive final round in which she shot a 4-under par 67 to finish at 17-under par overall, maintaining her extraordinary form on Malaysian soil. Feng started the final round in less than spectacular fashion, with a bogey on the first hole, but remained calm to enjoy a bogey-free remaining round, while picking up five birdies along the way. Said Feng: “I have to say thanks to my caddie. I met him here five years ago and we’ve been working together since then. Every time I’m playing here, I play great, and I couldn’t have done it without his help." 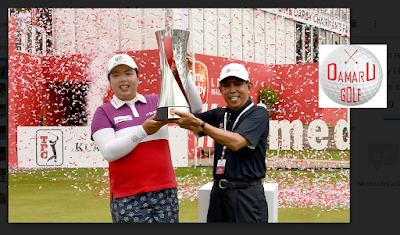 Speaking on behalf of tournament sponsor, Chief Executive Officer of TPC Kuala Lumpur and Chairman of Tournament Committee, Steven Thielke, said, “Congratulations to Feng Shanshan for an outstanding display of golf over four days. She is a highly deserving champion and her record at TPC Kuala Lumpur speaks for itself.